Tag Archives for " The Marketing Performance Blueprint "
Back in the day all a marketer need do is create a compelling ad, run it in the right place and if sales went up, job well done. Today there are several hundred television options in a local market, countless social channels and a host of web and mobile advertising platforms to choose from. More than ever marketers must measure every event and track performance based goals and objectives they can impact. In addition to running a very successful inbound marketing agency Roetzer now spends a fair amount of time consulting with other agencies. His approach to fee based billing, account teams, internal training and performance measurement make an essential blueprint for any service based business. 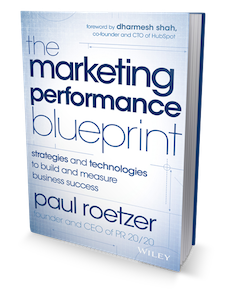 Make sure you check out Roetzer’s free Marketing Performance Pack.